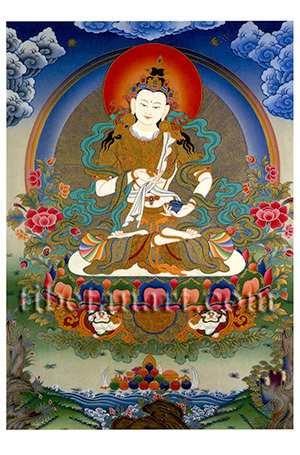 Vajrasattva, 'the vajra-hero', is a yidam or meditational-deity whose practice is commonly employed to purify the defilements of body, speech and mind. This visualization practice is believed to be particularly effective in overcoming the emotional delusions of anger and hatred. A hundred thousand recitations of his hundred-syllable mantra are traditionally performed as one of the four 'preliminary practices' of the Vajrayana or Tibetan Buddhist path. Here Vajrasattva is shown seated in vajra-posture upon a white moon disc and a multicoloured lotus that is supported by two white lions. He is white in colour, as youthful as a sixteen-year-old, with two bow-shaped eyes, a sweetly smiling face, and he is adorned with the five silk garments and the eight jewelled ornaments of a bodhisattva. With his right hand he holds a five-pointed golden vajra before his heart, and with his left hand he holds an inverted silver bell at the level of his hip. His black hair is bound up into topknots and hangs freely about his shoulders, and the scintillating golden rays of his aura are encircled within a rainbow of coloured light.